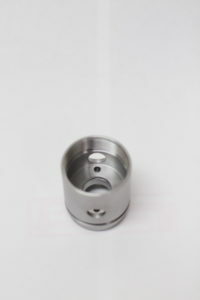 DESCRIPTION: Machined complete from 316 stainless steel bar. Multiple features positioned in relation to each other to extremely tight tolerances. TOLERANCE: +/-.0002 bore diameter. Multiple diameters to +/-.001. Position of holes/features to datums within .001.